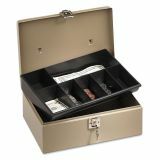 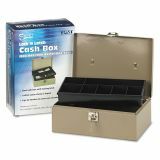 PM Company SecurIT Lock'n Latch Steel Cash Box w/7 Compartments, Key Lock, Pebble Beige - Cash box features a locking latch, removable seven-compartment plastic tray, and room for document storage underneath. 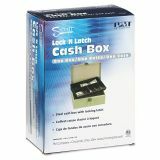 Close cover with latch or lock with key for extra security. Design includes a convenient carrying handle for easy transport. 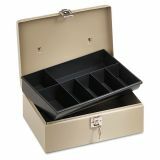 Box is made of steel.